The Precor C962 treadmill has been discontinued by Precor but you can purchase it as a remanufactured treadmill at a substantial discount. With twenty years of experience and Precor’s commitment to quality, the C962 model is another fine example of what every treadmill should have - basic features you can use and a solid construction that will last. The Precor C962’s durable 4.0 hp pulse width modulation motor delivers extra power and improves the reliability and efficiency of the unit by lowering the current draw. The treadmill’s extra large running surface includes an impact control system that cushions your foot from the heel to the toes, allowing the body to absorb each impact easily and fluidly. Remanufactured home treadmills are not covered by the original warranty, but the level of quality in the refurbishing process doesn’t really necessitate it. You’re certain to be able to get the C962 treadmill repaired even if you do need new parts down the line. Precor is a company that’s not going anywhere. UPDATE: The Precor C962 has been discontinued and is no longer available. Check out the latest Precor treadmills at the company store to find a comparable model on sale. Testers are very impressed with the smooth running motion that the Precor C962 offers. Experts praise Precor’s microprocessor controlled integrated footplate technology which constantly adjusts the speed of the treadbelt for added safety and comfort which in turn preserves the natural walking and running motion. Owners of the remanufactured Precor C962 like the treadmill’s exclusive belt drive system which eliminates lubrication or waxing, thus greatly reducing maintenance requirements. Consumers also find the optional heart rate monitor a good investment; it’s easy to overexert on this powerful treadmill. We are big fans of remanufactured Precor treadmills because they give the at home exerciser the chance to own a piece of commercial grade exercise equipment for a fraction of the price. 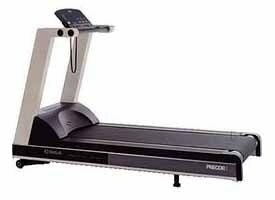 The remanufactured Precor C962 treadmill is a machine that was originally designed for 16 hours a day of use. It will last a lifetime in a typical home gym environment.